Paula Deen uses a lot of butter, this is a well known fact. Tonight I made her pie crust and I didn't f**k it up, I think it's because there was a lot of butter in it. The last time I had a homemade pie crust come out I think I was standing on a chair in the kitchen playing with dough while my mom rolled it out (just like Molly did tonight). I almost go so far as to say that this crust recipe might be fool-proof. But I think the key is to NOT over-work it. I used my hands, added the ice water (for sure closer to the 1/2 cup if not more) and wrapped it up. There were still visible chunks of butter in the dough. I learned a while back that the pockets made by layers of butter between flour are what make the flakiness, so I was not afraid that there were big pieces of butter I didn't crumble down. It's also KEY to let it rest and chill in the frig. They allows the gluten to do it's magic. Here is the Apple Rhubarb Pie with nice flaky crust, so easy! In a large mixing bowl, sift together the flour, salt and sugar. Add the shortening and break it up with your hands as you start to coat it all up with the flour. Add the cold butter cubes and work it into the flour with your hands or a pastry cutter. Work it quickly, so the butter doesn't get too soft, until the mixture is crumbly, like very coarse cornmeal. Add the ice water, a little at a time, until the mixture comes together forming a dough. Bring the dough together into a ball. I don't have pictures, but you can use your imagination for this one. Cut some bacon into smallish pieces, cook in a pan until crispy and then drain on some paper towels. When cooled, chop finer. Add 1 teaspoon of yeast and 1 teaspoon of sugar to 1/2 cup warm water (105 degrees), let it sit to activate and get frothy. Separate three eggs and whisk the whites until they form stiff peaks. Set aside. Add yeasty water, about 1 cup of buttermilk, 2 tablespoons of melted butter and egg yolks to the dry ingredients, mix. Fold in the egg whites gently. Cover and set aside for up to an hour to rise. Heat your waffle iron, spray with oil, put in a scoop of batter, sprinkle with chopped bacon and cook. These are great served with a little butter and maple syrup. I was watching the Food Network last week and got inspired to make something Irishy for the 17th. This is what I made, adapted from Bobby Flay's Taste of Ireland show. It's a rustic slab of ham, sauteed cabbage and creamy mashed potatoes! It turns out I've never cooked a ham. My family just wasn't traditional-Americana that way. We did goose, duck, lamb or mussels for the holidays. We never ate a ham. But I bought a ham the other day. I really didn't know which one to get and I didn't think it would make that big of a difference because I didn't have high expectations for this meal (ham dinners have always been bland and boring to me). I bought a smoked ham and brought it home. What made it's way into our mouths might be a new all time favorite meal. Cover potatoes with water in a large pot and a good dash of salt. Boil until soft all the way through. While the potatoes are boiling, place garlic, olive oil, rosemary, pinch of salt in a foil pouch and bake at 350 for 10-15 minutes. When the potatoes are done, drain and place in a large bowl. Add roasted garlic and rosemary, cream cheese, butter and milk. Mash and mix until creamy but don't over mix. Cover and set aside. -A big fat smoke cured ham on the bone. I cut a big portion off and boiled it until the meat read 160 degrees in the fattest part. I cut off a big chunk of fat off the remaining ham and trimmed the smoked layer off so I had pork fat, pure and simple. I chopped the fat into little cubes and fried it. I did not really plan this, it just happened. But seriously, who wouldn't fry up the little bits when presented with the opportunity? After a few minutes they were all browned and crispy. I drained them and set them on a paper towel. So yummy! When the ham meat was ready I removed the slab and sliced it up and put it back in the hot water to hold until I plated. In a large saute pan heat oil and caramelize onions slowly. Add cabbage, toss to coat with oil, add wine and liquid, cover and cook for 4-5 minutes. Toss cabbage around and make sure that it cooks evenly but serve it while it's a little al dente. I put everything together and it was AMAZING!!!! But I think many things can be amazing when cooked with bacon fats and crispy bits. I seasoned everything with salt and pepper as I went, but when we got to the table nothing more was needed. Tacos al pastor (Guadalajara), a torta ahogada (Guadalajara), and guacamole and ceviche (Melaque): only a small representation of my favorite things to eat in Mexico. Seriously, who doesn't like going to a middle eastern restaurant and dipping hot flat breads into fresh hummus? Or wrapping up some savory meats in a soft, spongy piece of bread? 1) I look forward to eating out less in the future. Yes, I said it. I'm looking forward to being more intentional and strategic about where I eat out. I want to try local ethnic restaurants to inspire me and meet new people. I don't want to eat out what I can make at home. I want to challenge myself to try other flavors. 2) Eating in for 40 days has forced me to make the things I crave. Before if I was craving hummus and flat bread, I would head out and order a mezza platter. 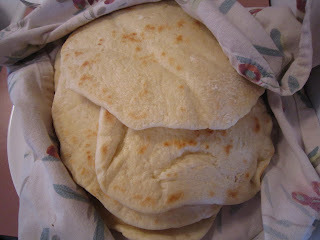 This all leads to me making a SUPER easy flat bread at home that saves for up to 4 days or can be frozen. Add yeast and sugar to warm water and set aside. In a mixer fitted with a dough hook add flour and salt, whisk together. When the yeasty water is frothy (about 3-5 minutes), add to the flour and turn to speed 2 or 4. Continue to add a little more water until the dough has pulled away from the sides. If it's too sticky add more flour. Once the dough is fully incorporated and looks soft, remove from mixer and place on floured surface. Kneed a few times to form a silky, elasticy ball. Place dough in a lightly oiled larger bowl and cover with plastic wrap or damp towel. It's best to make sure the dough was coated with oil on top too so a dry crust does not form. Let rise for 1-2 hours, punch down, form into a ball again and cover. Let rise for up to 3 hours longer. Remove dough from bowl and kneed a few times. Portion dough into equally sized balls. The larger the ball the larger the flat bread. Somewhere between a golf ball and a racquetball. Let the balls rest for 10 minutes. Roll out until they are pretty thin. Cook in a pan on medium high heat. Spray or brush both sides of the bread with a little bit of oil. When they are browned and bubbly they are ready to come off. Store on a plate with a clean kitchen towel to wrap them in. Serve warm. Store them in an ziplock bag up to four days. Heat on the stove top when ready to enjoy. After making the Chili posted the other day we had a lot of leftovers. I decided to turn it into a burrito filling with fresh made tortillas. They took a little bit of time, but it was easy and worth it! Whisk dry ingredients in a large bowl. Add shortening and work in with your hands or a pastry cutter. Add a little water at a time until you can form a soft dough that is not too sticky. Kneed for a few solid turns until everything is incorporated and smooth. Cut dough into 12 or more little balls and set on a pan to rest for 10-15 minutes. 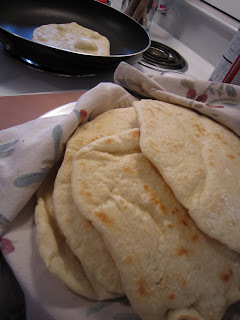 Roll each ball of dough into desired shape of tortilla, making sure they are very thin. Cook on a hot pan long enough to lightly brown but not burn, flipping once. If the pan is too hot they will burn before they cook through. As they come off the pan place them in a clean kitchen towel to keep them from drying out. I made them on a griddle so I could cook 3 at a time. This worked but I think a pan would have been a little hotter. They got a little dry, but they were still AWESOME!